Medium: original lithograph. A nice impression on wove paper, this original Poliakoff lithograph was issued in 1958 for the hard-to-find XXe Siecle (No. 10), published in Paris by San Lazzaro and printed by Pons. Sheet size: 12 3/8 x 9 1/2 inches (315 x 242 mm). Not signed. XXe Siecle (Chroniques du Jour) was a deluxe art revue that was the source of many outstanding prints. It was published by Gualtieri di San Lazzaro from 1938-1939, and again from 1951 until 1978 (known as the Nouvelle Serie). Many important artists contributed original prints, including Miro, Picasso, Chagall, Braque, Villon, Matta, Indiana, Rosenquist, Lam, Dali, Zao Wou-ki, Matisse, Delaunay, Ernst, Poliakoff, Soulages, Leger, Moore, Kandinsky, Agam, Arp, Calder, Magnelli, Baj, Marini and Vasarely. Medium: color pochoir. 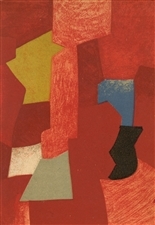 Printed in Paris for the Temoignages pour l'art abstrait project (Witnesses for Abstract Art), published in 1952 by Editions d'Art d'Aujourd'hui, in an edition of 1500. The sheet size, including margins: 9 1/4 x 7 3/4 inches (235 x 193mm). This is a splendid and richly inked impression on wove paper, and now quite rare. Not signed (the artist's name is printed in text beneath the image). Condition: there is minor creasing near the top left corner. Medium: original lithograph. A nice impression on wove paper, this original Poliakoff lithograph was issued in 1968 for XXe Siecle (issue No. 31), published in Paris by San Lazzaro and printed by Mourlot. Sheet size 12 1/4 x 9 1/2 inches (310 x 240 mm). Not signed. Medium: original lithograph. Executed in 1961 for XXe Siecle (No. 17), published in Paris by San Lazzaro and printed by Pons. The total sheet measures 12 1/8 x 9 1/8 inches (310 x 230mm). Not signed. Medium: lithograph (after the gouache). Printed in Paris in 1957 by Mourlot and issued in an edition of 1000 by the Galerie Berggruen for a rare catalogue. Image size: 6 1/4 x 4 1/2 inches (160 x 114 mm). There is printed text beneath the image (see the second photo). Not signed. Condition: as this was the actual back cover of the catalogue, there is wear and soiling. Condition: as this was the actual front cover of the catalogue, there is wear and soiling.